DAYTONA BEACH, FLA. (July 1, 2015) — During Cale Conley’s second visit to the famed Daytona Beach super speedway this Fourth of July weekend, his No. 14 Iraq and Afghanistan Veterans of America (IAVA) Toyota Camry will feature #VetsRising decals on the hood and lower rear quarter panels in honor of our returning veterans. IAVA’s #VetsRising messaging is about demonstrating the power of America’s veterans through stories and pictures. From starting new businesses to giving back to their neighbors, the 2.8 million members of the New Greatest Generation are working every day to make their communities a better place. IAVA is encouraging everyone to use the #VetsRising hashtag on social media posts to demonstrate how veterans are not just meeting today’s challenges, they’re rising above them. 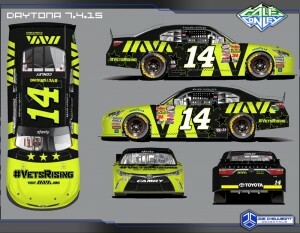 Seven IAVA member-vets will spend a “behind the scenes” day in the pits with Cale and his crew during the race on July 4. In addition, veterans and family members are invited to join IAVA for a July 3 for a VetTogether rally in support of Conley. Member of the media are invited to attend. To RSVP please contact press@iava.org.